Summer is in full swing, and for many Americans that means high temperatures and even higher electric bills. The amount of energy used to heat, cool and ventilate buildings in the United States is enormous, equivalent to approximately 13% of the country’s annual power use. This is in part due to how inefficient environmental systems can be, which results in significant power wasted or lost. But as anyone who’s spent a summer in Florida, or a winter in Wisconsin, knows, heating, ventilation, and air conditioning (HVAC) are often essential to comfort and health. HVAC technologies are critically important and ripe for innovation, so ARPA-E supports multiple projects for building efficiency, enabling Americans to enjoy clean and comfortable air while—hopefully—drastically reducing their energy bills. Check out these three projects working to improve building efficiency through innovative technologies. As kids, many of us heard our parents yell to close the door because we were letting the air out. In many buildings, the first line of defense against wasted energy is plugging the holes where heat gets out or in, depending on the season. An OPEN 2012 ARPA-E project at UC Berkeley sought to tackle that problem using a portable energy audit tool called RAPMOD. Comprised of a suite of cameras and sensors packaged neatly into a wearable backpack. The RAPMOD can complete an audit of a 69,000 sq. ft. building in about one-sixth the time needed by a manual audit, today. The UC Berkeley team spun out a new company, Indoor Reality, which has obtained additional private sector funding, to advance their new technology, and continues to perform scans for a growing customer base. Outside of an igloo, the idea of cooling a building without using electricity at all sounds like pure imagination, but an ARID project team from CU Boulder is working on a technology that does just that. Their thin “RadiCold” film lets light pass through uninterrupted while blocking heat. Stranger though, is the film’s ability to send heat from the environment straight into space using a process called radiative cooling. The unique nature of the film—which can be produced in a roll-to-roll manufacturing process—enables it to cool the covered area, actually bringing it below the ambient temperature by as much as 18 °F during the day and 28.8 °F at night. 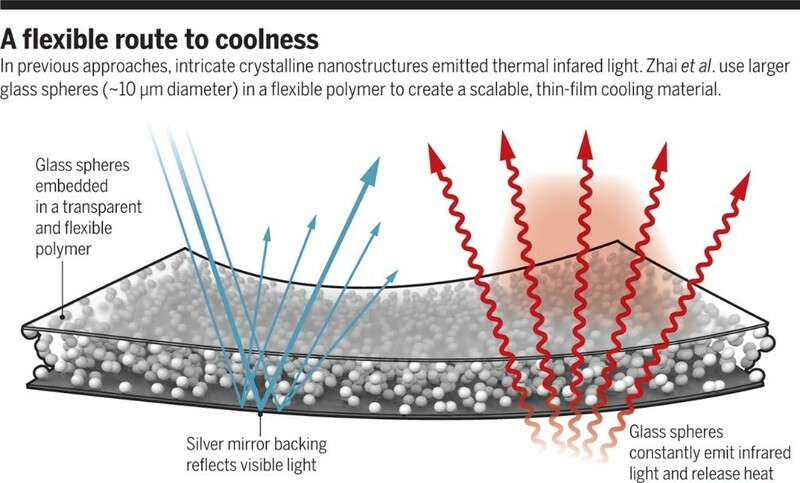 By capturing heat and emitting it straight into the cold of space, Radi-Cool’s film could greatly reduce the amount of energy needed to keep buildings cool. The company believes applying the film directly on a building’s roof could reduce air conditioner energy use by more than 30%. Of course, buildings are heated and cooled primarily to keep their occupants comfortable, but there is more than one way to keep humans at the right temperature. A team at Otherlab, part of the DELTA program, has developed a fabric that can change its physical characteristics to alter its insulating ability for the wearer. 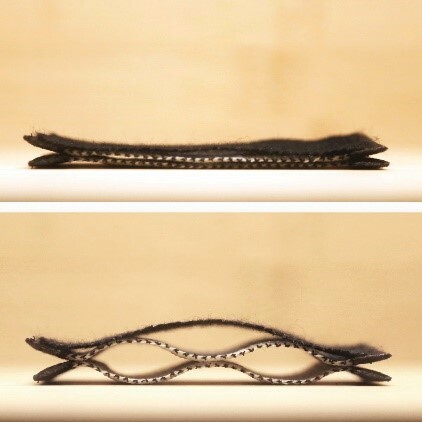 Photo: Thermally responsive textile at room temperature (top, textile is flat) and at a cold temperature (bottom, textile is lofted). Otherlab’s textile is capable of doubling its insulating value between a temperature change of 81°F to 63°F. The fabric accomplishes this impressive feat using a set of materials that expand and contract at different rates when the temperature changes. This mismatch causes the material to balloon out, increasing its insulating ability. Incorporated into clothing, this material could help keep building occupants comfortable across a greater range of temperatures, translating into energy savings. ARPA-E projects build cross-cutting teams that call on multiple disciplines and diverse experiences to advance the frontiers of energy innovation. For a challenge as imposing as slashing the energy used by our buildings, this multidisciplinary approach enables teams to explore new technologies with a fresh approach. The result? A suite of new tech with the potential to transform how humans stay at a comfortable temperature. Data adapted from EIA’s Commercial Building Energy Consumption Survey (CBECS 2012) data and EIA’s Residential Energy Consumption Survey (RECS 2008) data.